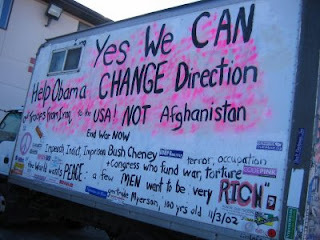 Which is what I painted on my truck today, as I get ready to head out of town on my Camp Hope tour across the country. We have elected Obama and I felt the hope surging across the nation when I drove from Atlanta to California the end of November. I also felt the fury of white males driving pick up trucks in Texas mostly. 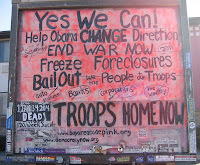 I want to focus on that hope and, inspired by the CodePINK chapter in Chicago, I will attempt to set up "Camp Hope" in the cities and towns I travel through, asking folks to bring their hope for our nation this upcoming year. I will take these hopes to Chicago, and then on to D.C.
i'm coming to the inauguration because i HOPE we can help obama CHANGE direction! From Iraq to the USA, NOT Afghanistan. i am almost 60 years old and i have worked my hardest to eliminate racism on all levels, personally, socially, institutionally, nationally - everywhere. i want the election of obama to be a blow to right-wing fascism, militarism, and fundamentalism, not just racism. i want to be the anti-war voice, pro-peace voice in washington d.c. this january 20th. i want this voice to be the LOUDEST voice ever.